Mrs. Gertrude (Wylie) Adams of 47 May Street, Hartford, widow of Howard Eldridge Adams, was born January 19, 1882 in Mulgrave, Canada, daughter of Sarah (Hadley) and David Wylie. She was found dead at the circus grounds after the fire on July 6 and was buried at Grove Hill Cemetery* in Vernon after services at the James T. Pratt Funeral Home. Gertrude attended the circus with her grandson, Roy Bell, Jr., who was also a victim of the fire. She leaves her daughter Mrs. Esther Eldora (Adams) Bell, 36, of New York; her brother Leonard J. Wylie, 52, of Hartford; and her sister Mrs. Eliza W. Martin, 66, of California. Body #1549 at the State Armory was identified as Gertrude Adams by her son-in-law Roy Bell on Friday, July 7, and on the body was found a gold wedding ring. 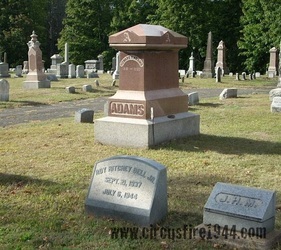 Mrs. Adams' estate was awarded $7,000 by the arbitration board.